DENVER – Many children in Colorado are not being tested for lead poisoning and as a result, many kids with elevated levels of lead in their blood are going undiagnosed, according to new research published this week. The study from The Public Health Institute estimates that only 6 percent of Colorado children with elevated levels of lead in the blood (defined as 10 micrograms per deciliter or higher) were actually identified between 1999 and 2010. That’s one of the lowest rates of diagnosis in the United States, according to the study’s authors. Lead exposure numbers are usually based on data from the Centers for Disease Control and Prevention, but the Public Health Institute says actual numbers are much higher because lead testing is not required for all children. The group looked at data from the National Health and Nutrition Examination Survey (NHANES) to estimate the number of lead-exposed kids between the ages of 12 months and 5 years old from 1999 to 2010 and then compared those numbers to the CDC’s data. 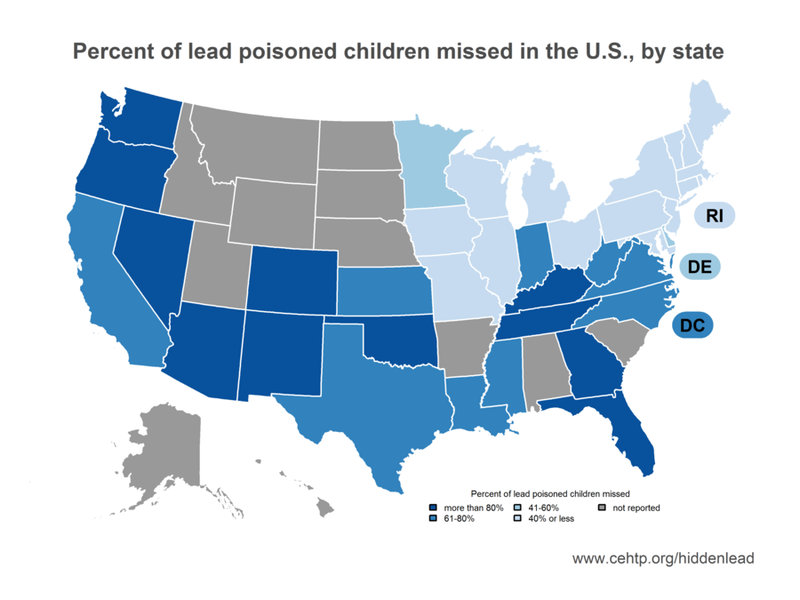 Based on that analysis, PHI estimates that the CDC’s lead data captures just six percent of lead-exposure cases in Colorado, with the highest concentrations in Denver and Colorado Springs . Because the majority of cases go undiagnosed, those children likely aren't getting any kind of treatment. Beyond Colorado, the study’s authors estimate that only 64 percent of children with elevated lead levels nationwide are diagnosed and reported to the CDC. According to the CDC, no level of lead in the blood is considered safe . Kids with high levels of lead in their blood often have no symptoms, but lead poisoning can lead to a number of learning and behavior issues. Lead exposure usually occurs from lead-based paint, but tap water can also be a source of lead, if a home has lead pipes. For more information on the study, including the methodology used, log on to cehtp.org/hiddenlead .